One of the leading Pakistani poets known for his layered poetic expression. 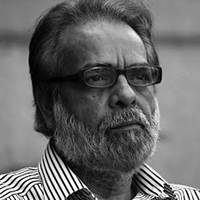 Afzal Ahmad Syed is a contemporary Urdu poet and translator famous for his dominance in classical as well as modern Urdu poetry. He is the author of the modern nazm collections (An Arrogated Past, 1984), (Death Sentence in Two Languages, 1990), and (Rococo and Other Worlds, 2000). Another collection of classical ghazals is titled خيمہُ سياہ (The Dark Pavilion, 1988). His work has been widely published in leading Urdu literary periodicals such as Shabkhoon, Aaj, and Dunyazad.